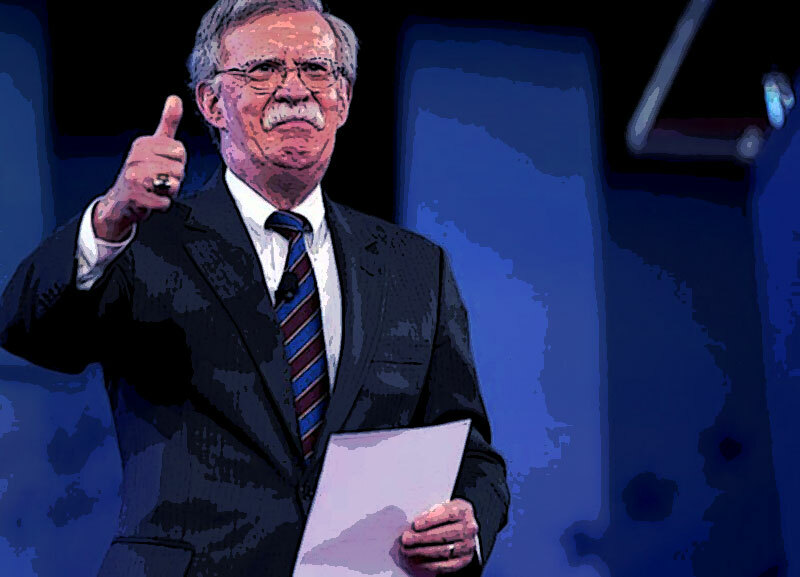 Warning – John Bolton admits that the US will invade Iran this year! The video proof is below. Trump stated that the Syria bombing was, “Mission Accomplished,” but was it? George W. Bush once said the same thing and we know how that turned out. It was a disaster. So is Trump correct? What is the truth folks? There is a lot of confusion out there. …But that’s the way it always is on the Eve of Destruction. Some of the confusion has Trump supporters believing that the present narrative is actually the Battle of Trump vs the Evil Globalists. Alex Jones had a rated R cussing fit on the night of the bombing, and cursed God along with Trump’s family, because he claimed that the globalists turned Trump and forced him to bomb Syria. But this was never the case. Trump was always one of them. He hangs out with the globalists, and attends their summits and forums. 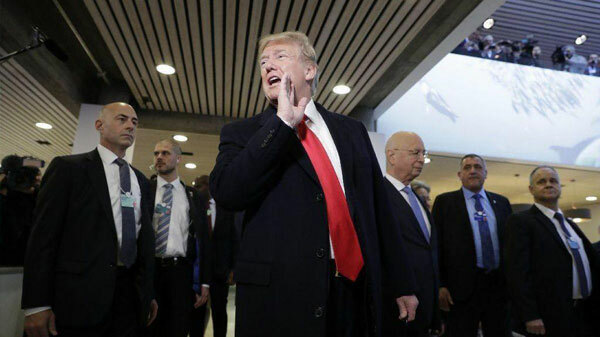 Below is Trump attending the globalist event – Davos. He is standing next to Klaus Schwab, the founder of the Davos Summit. 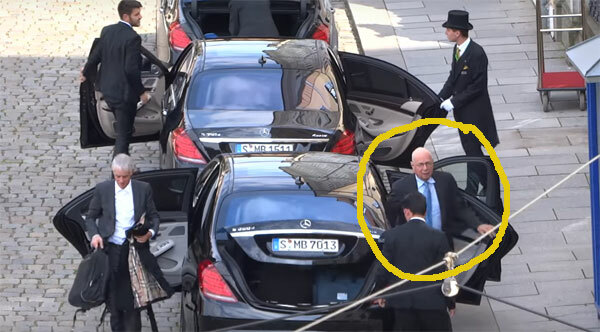 Klaus Scwab is also a Bilderberg member. 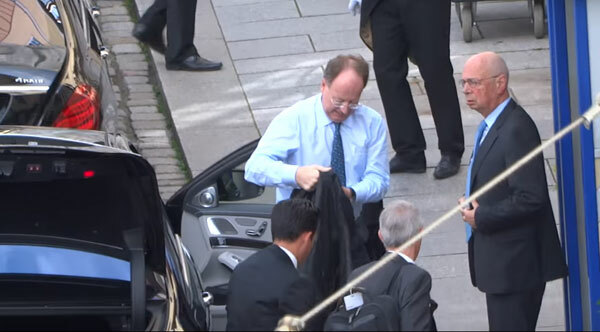 Below Schwab arrives at the Bilderberg meetings in 2016. Trump has turned these globalists into the world’s royalty. But some of his support base does not seem alarmed by this development because in Trump’s evangelical universe, the globalist are now harmless peons. Therefore, Trump can attend their meetings, and plan your future, because he has America’s interests at heart……just like Goldman Sachs does. 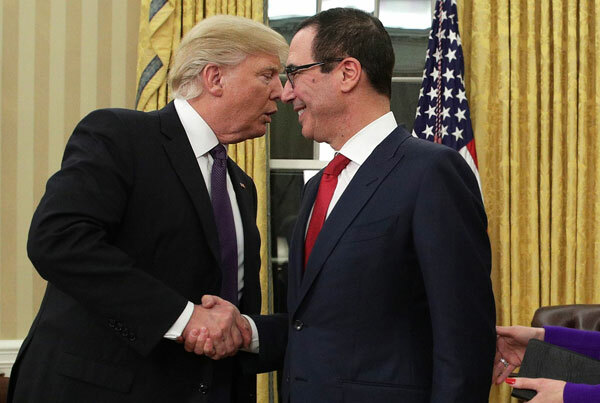 That is why Trump placed ex-Goldman Sachs banker (Steve Mnuchin) in charge of the US treasury. Trump is surrounded by globalists. He employs them on his cabinet. I am getting to that. But it is important to see that Trump is buddies with globalists and war hawk neocons. Why is he so chummy with them? Simple. Trump is their Trojan horse. His job was to gain access to the White House and the LAUNCH CODES! …and open the back door to let them in. Trump was chosen folks. One of the biggest reasons was to take the America to war. He recently hired John Bolton, one of the most pronounced war hawks in Washington. Bolton was an original member of the Project for a New American Century. He helped to write it. War has always been a part of Trump’s instructions. I stated this over a year ago when Trump projected it during his Inauguration. Do you remember what Trump did that day? 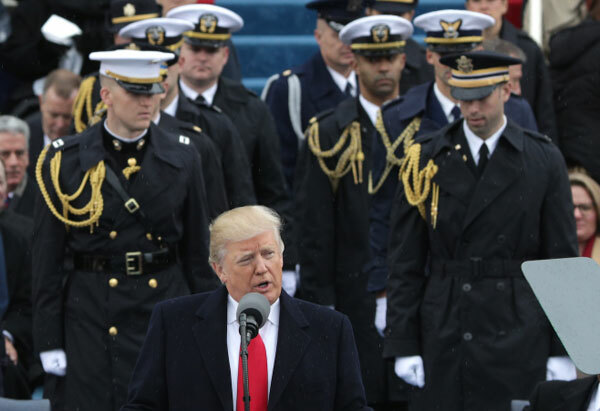 He positioned military officers behind him as he gave his speech. This spoke volumes for those who have the eyes to see. Unfortunately, a lot of folks refused to see, because they were sold a lie. And even now, a portion of the Trump base still thinks that Donald Trump is operating in 4D or 5D chess. Imagine that? Even after he revealed his true colors by funding abortion. If Trump was against future war, he would have allowed the Organization for the Prohibition of Chemical Weapons or OPCW, to thoroughly inspect the site of the alleged chemical poisoning. The OPCW was scheduled to arrive in Syria on Saturday, April 14, 2018 for an inspection of the “alleged crime scene.” But the United States did not wait for them. Instead, the US along with Britain and France, proceeded to bomb Syria without proof. Trump also conducted the attack without the approval of Congress, which is illegal. I think police detective school would call the similar verbiage, a pattern. Can anyone say, “Downing Street Memo?” Do you remember that one folks? The memo revealed that George W Bush decided to invade Iraq nine months before the Iraq war began. The memo contained the minutes of a meeting that took place on July 23, 2002, with then Prime Minister Tony Blair. The memo has a lot of admissions. One of them is from Richard Dearlove, who was then head of MI-6, the British foreign intelligence service. c) was “fixing” intelligence to sell the impending invasion to a duped American public. In other words, the United States and Britain knew that Saddam had no WMDs, but they wanted the war, so they decided to give the world fake intelligence about Iraq’s Weapons of Mass Destruction that did not exist. The same thing is happening now. Russia asked the United Nations to inspect Syria for proof that Assad poisoned his people, but the United States did not want to wait. And the rest is history. … And why did Donald Trump bomb Syria without congressional approval? … Why did British Prime Minister – Teresa May do the same thing? Parliament wanted her to wait, but she didn’t. Something stinks folks. And sadly, history will judge that the United States was on the wrong side of justice by attacking a sovereign nation without valid proof of guilt. As Christians, we are supposed to respect justice, and truth. But unfortunately, Trump is on the wrong side of these things. So how can they be defended? Sadly, this is another display of evidence that reveals Donald Trump’s presidency was never going to forsake more wars. On the contrary, Trump was selected to take America to war. He was selected to invade Iran, North Korea, Syria, and if he lasts long enough, war against Russia and China. Donald J Trump is a war president! And in the remaining minutes of America, the United States is going to return to the neoconservative doctrine of preemptive war, regime change, imperialism, and chaos. It is happening before our eyes. John Bolton oversaw the recent bombing in Syria. He is going to also oversee many military campaigns that are approaching, and ladies and gentlemen, this is just the beginning. Prepare to see another chemical attack in Syria, as well as other false flags events throughout the world. When they occur, some of them will be blamed on the Axis of Evil, which includes Iran, North Korea, and now Syria. What is the Timeline for War? This is the gazillion dollar question, but John Bolton recently stated that America will be in Tehran, Iran before 2019. Did you get that my friend? John Bolton recently stated that America will be in Tehran, Iran before 2019. In order for that to happen, it will require an American and NATO invasion with boots on the ground in Iran to conduct regime change. Get your lives in order brethren because the rider of the red horse just dropped off a passenger in DC, and his name is John Bolton.